37. James Lewis Little. Son of James Little & Isabella "Belle" Herbert (Link to Herbert Family pages). Born 22 Feb 1859 in Harvey. Christen 6 Mar 1859 in Harvey Presbyterian Church. Died 28 Apr 1940 in York Mills. Buried in Harvey Settlement Cemetery. 4120. 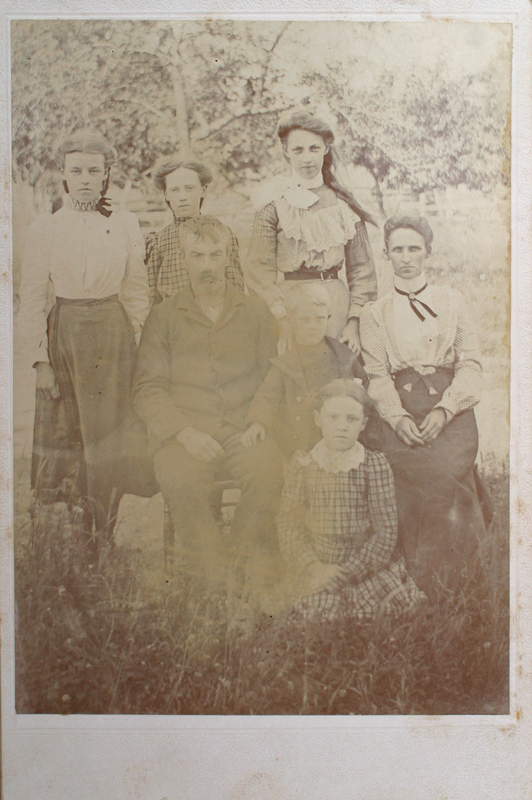 Undated cabinet card of family of James Lewis Little (Born 22 Feb 1859 in Harvey. Died 28 Apr 1940 in York Mills). Son of James Little & Isabella "Belle" Herbert, and wife Annie F. Parker, daughter of William Parker & Jane McLean, Born 1866 in Pokiok Settlement. Died 11 Oct 1934. Also in photograph four of their children; Vivian Fredrica Little (b. 20 May 1887) ; Amy Ora Little (b. 27 Sept 1888); Tressa Jane Little (b. 25 June, 1890); Mina Isabel Little (b. 28 May, 1894). James L. Little, York Mills, Died at age of 81. May 10 -- Friends of James L. Little of York Mills, were shocked to hear of his sudden death on April 28, although having reached the age of 81, he was always active and able to go among his friends. He leaves to mourn their loss five daughters, Mrs Guy Little, Mrs Elmer Wilkin, Mrs John Briggs, Mrs Lorne Little, and Mrs Harold White of Providence, RI, and one son, James Kenneth, with whom he made his home. The funeral service was held in the Universalist Church of which he was a member. Rev. G. McKay of the McAdam United Church preached a very fitting service. Six grandsons were pallbearers: Elwod Little, Claude Little, Lewis Little, Ross Briggs, Allan Briggs and Lloyd Wilkin. The floral tributes were beautiful and contributed much to the respect with which he was held. He married Annie F. Parker, daughter of William Parker & Jane McLean, 11 Nov 1885 in York Co., NB By William Ross, Presbyterian. Born 1866 in Pokiok Settlement. Died 11 Oct 1934. Buried in Harvey Settlement Cemetery. Witnesses to marriage were Thomas H. Little and Maggie L. Wilkins.